In 1989, Walt Disney Productions released The Little Mermaid, an animated film based upon the fairy tale written by Hans Christian Andersen. The worldwide response was an overwhelming one. The film has grossed over $200 million worldwide and has been credited with launching the Disney Renaissance, an era that breathed life back into the animated feature film genre. 1. In designing heroine Ariel, the animators were inspired by the body of Alyssa Milano (Who’s The Boss? star) and the hair of astronaut Sally Ride. Ariel’s underwater hair sequence was based on a video of Sally’s hair as she traveled in zero gravity. 2. 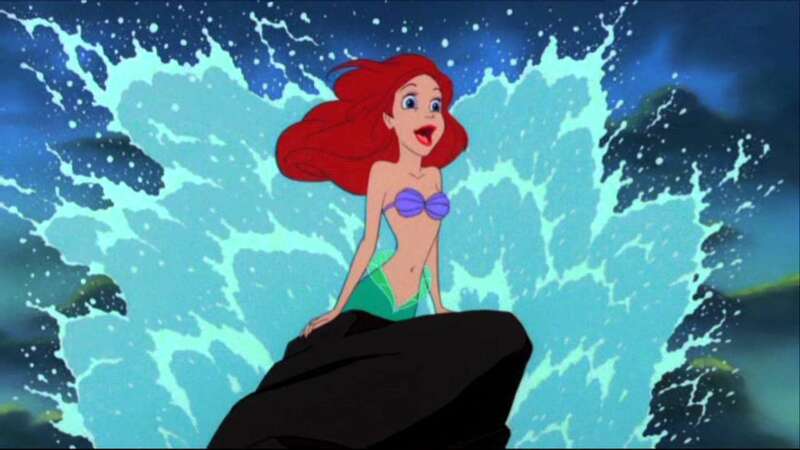 To avoid confusion with Daryl Hannah’s mermaid in Splash, the animators decided to make Ariel a redhead. 3. The voice actor for Prince Eric was sixteen-year-old Christoper Daniel Barnes. 4. The villain Ursula was designed to resemble Madame Medusa from “The Rescuers” and cinema drag queen Divine, best known for his roles in Pink Flamingos and Hairspray. 5. Originally, the producer asked Bea Arthur to play Ursula, but she dropped out of the film because of “Golden Girls” conflicts. Rosanne Barr and Nancy Wilson were also considered until Elaine Stritch was cast. Unfortunately, Elaine proved incompatible and was replaced by Pat Carroll. 6. Patrick Stewart was offered the role of King Triton but had to turn it down because he was too busy with “Star Trek: The Next Generation.” Kenneth Mars was cast in the role. 7. Jodi Benson recorded “Part of Your World” with the studio lights turned low to simulate the feeling of being underwater. This classic Disney tune was almost cut from the film because the director thought the song was too boring. 8. In the opening scene with King Triton, Micky Mouse, Goofy, Donald Duck, and Kermit the Frog appear in the crowd of sea-people. 9. During Eric and Ariel’s wedding scene, the Grand Duke and King from Disney’s Cinderella can be seen in the background. 10. The directors insisted that every bubble in the movie be hand-drawn, not Xeroxed. Animator Mark Dindal estimated that he and his colleagues had to draw a million bubbles. This entry was posted in Mermaids, Mondays for Mermaids, Power of 10 and tagged Joanne Guidoccio, The Little Mermaid. Bookmark the permalink. Love this, thanks for sharing. I’m very glad that they didn’t cut Part of Your World, that would have been a travesty. Fascinating. A reminder that inspiration can come form anywhere and everywhere. My girls loved this film… and held on to the VHS version long after CD’s came on the scene. Love your mermaid facts Joanne. I wonder how long it takes to hand draw a million bubbles? Joanne- this is so cool! JUst last night I watched a documentary on PBS about Walt Disney.